A child has gone missing, an elderly woman has wandered away from home, a skier has been caught in an avalanche, a young boy has been swept away in a flood, a troubled young man has taken his life in the wilderness. These are some of the circumstances for which Great Basin K9 SAR has supported public safety agencies throughout the Intermountain West in the years since our founding in 2008. 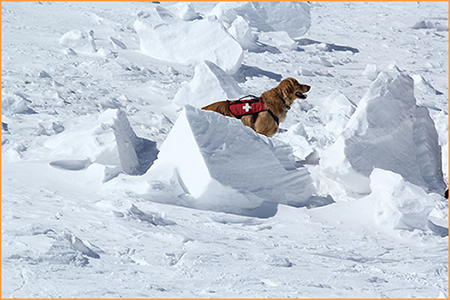 Our volunteers and their K9 partners have traveled thousands of miles and spent countless hours searching in difficult terrain and all weather conditions both day and night. We have provided these services at no charge to the agencies and organizations we have supported and, with your help, we are committed to continue this policy into the future. To understand Great Basin K9 you need to understand three things; our standards, our people, and our dogs. We understand that when we embark on a search we may be the difference between life and death for someone in our community. Because we take this responsibility very seriously, we train our K9 teams to the highest standards. GBK9SAR is a proud member of Tri-State K9 SAR, an association of search dog teams from across the Intermountain West (Utah, Wyoming, Idaho, Montana, and Nevada). Tri-State K9 SAR has established a rigorous set of certification standards and all member groups have agreed not to field any dog teams that have not met these standards. To see these standards, click here: http://www.tri-state-k9.org/StandardsUpd.aspx?mn=5. 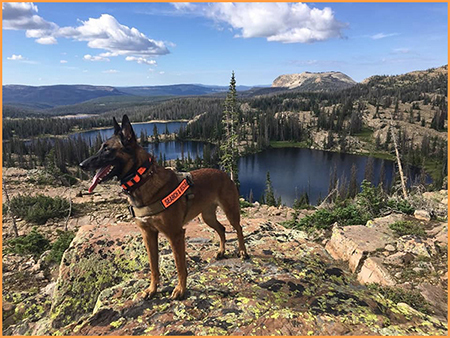 We also have additional Great Basin K-9 SAR standards which require "out of area" evaluators and separate GBK9SAR open and shoreline water search standards. Meeting these standards requires many hours of work over a year or more to get a team ready for certification testing. Many of our teams travel to training seminars where they can learn from other experienced trainers and search experts. 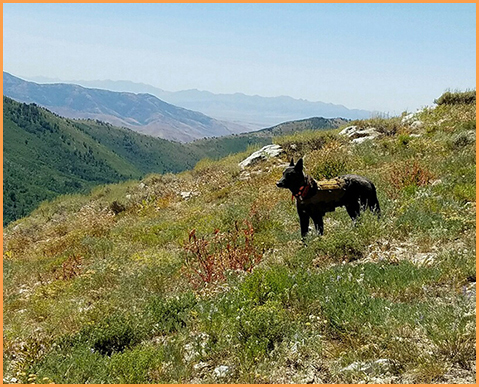 Testing is rigorous and always conducted in realistic terrain and performance is evaluated by experienced SAR dog handlers from outside of Great Basin. The primary question each evaluator asks themselves when conducting a test is, “If my child or my mother was lost, would I want this team searching for them? Our people are all volunteers, we have no paid staff. When they join Great Basin K9 SAR they bring a wide array of skills that are critical to search missions. Our current members include a retired FBI agent, military combat veterans, former and current EMTs and paramedics, ski patrollers, field dog trainers, and avid outdoors persons. We train together at least once a week to share our skills and experiences to help each team improve. In addition to learning to work with our K9 partners in search situations we must also all be competent in land navigation, radio communications, wilderness survival, wilderness first aid (both human and K9), crime scene and bio hazard procedures, and disaster management at the local, state and national level. Most of our Handlers are also NASAR SARTECH II certified. The key component of Great Basin K9 SAR is our dogs; they are the reason our organization exists. The capabilities they bring to a search and rescue mission are so amazing they can be hard to believe. They can find people buried under six feet of snow. They work off lead in wilderness terrain and, when they find someone, come back to their handler and lead her/him to the person – just like Lassie. They can detect the faintest odor of human remains from hundreds of yards away and help bring deceased victims home. They are German Shepherds and Malinois and Labs and Golden Retrievers and Hounds. They are just like your dog at home, except… they are different. For some reason they have the drive to hunt and search and keep hunting and searching even when they are tired and cold and wet. They do it to get their reward, which is usually a few minutes of play with their favorite toy. But, they do it mainly because that is what they were born to do. Selection of our dogs is the most critical part of our training and preparation. No matter how good the trainer or handler, if the dog is not right they just can't do the job effectively. We are very fortunate to have a great bunch of dogs at Great Basin K9 SAR.